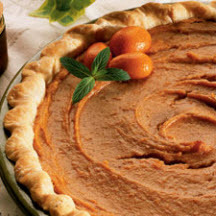 Down home, sweet Southern comfort—sweet potato pie, perfect for a holiday, or any day! Peel sweet potatoes; cut into 1 inch chunks. Bring to a boil in water in covered 3 quart saucepan. Reduce heat and cook until tender, about 20 minutes. Drain and discard water. Cut butter into several small pieces. Add butter pieces to potatoes and beat until thoroughly blended into potatoes. Spoon into prepared pie crust and bake in a preheated 350°F (175°C) oven for about 1 hour and 15 minutes or until center of pie is firm. Remove pie to cooling rack. Cool completely before serving.